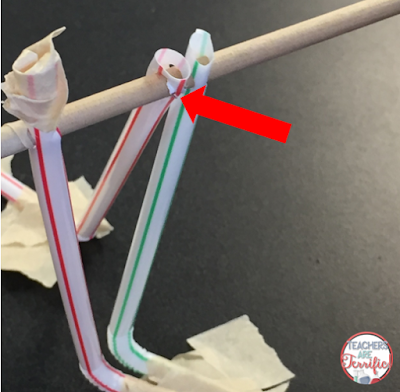 We had the MOST fun ever with this design challenge! My test class loved being the guinea pigs for this challenge and helping decide on the rules of the task! It's the second in a trio of rescue operations. The basic premise is that a team member has fallen over a drop-off and must be rescued. The remaining teammates must use what they have in their backpacks and sticks laying nearby to build a contraption that will reach the bottom of the ravine and then successfully wind up the fallen team member. Who are we going to rescue? 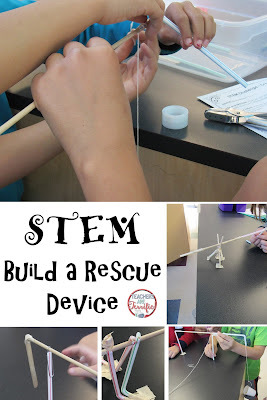 My first idea about this challenge was to give kids some basic building supplies and they would make a cranking or winding device. The fallen teammate would be a Lego man. Okay........I should have thought about that a little longer. The group in the above photo made a fishing pole and scooped the Lego man right out of that ravine. It took them about 2.5 minutes to do this. Now, my students are quite understanding and patient with new challenges. In fact, they LOVE to be the test class. They know when I announce that the group is testing the challenge that it will be interesting. I am quite honest with groups when I tell them, "Oops, that didn't work exactly like I thought it would!" As soon as I say this we all know that we are about to STOP and talk about what is going wrong and how we can change the task rules and make it work better. As soon as I saw that fishing pole I said. "AGHHHHH, time to talk about adding some rules to this task!" We came up with this: the device must wind up. Then we had this! The group above just laid the long pole on the table top and wound it up. Oops, that is not exactly what I was thinking. How heavy is a log? I climbed down with it and handed it to the first student I came to. Whereupon, he almost dropped it! Ha! A log is maybe a little bit heavier than you expect! That log is about two and half feet long and 8 inches in diameter. After letting everyone try holding the log and attempting to hold it and wind it, the kids understood that this would not be possible with a real log on a cliff side! So, we went back to make sure our rules for this task were detailed. The device that extends over into the ravine must be strong enough to attach a container and then be wound up. To wind it up we decided a handle would be best. This was after a discussion of what kinds of real things kids have seen that would work like this. Two things were mentioned- a fishing rod and reel and the jack system used in a car. A student said the jack his dad uses has a fold out handle that makes it easy to turn. So, we got back to work! I love this photo. Sometimes I worry that groups of four students is just too many. Partners are sometimes the ideal number, but the cost of supplies keeps me from always using partners. However, we also discover that many hands are sometimes needed! So, were we able to solve this dilemma and follow the rules of the task? Can you see what is going on with this one? 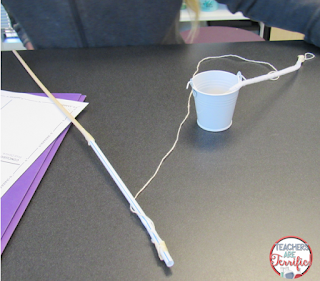 The string is threaded through a straw and the straw is attached to a dowel stick. 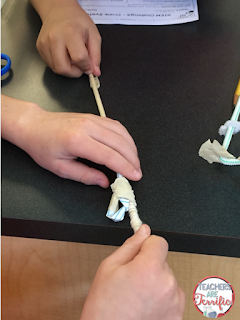 The handle to turn the dowel stick was added later and when the kids turned it the string traveled through the straw and wound around it. 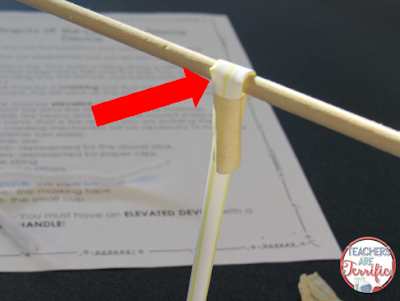 By far, the hardest part of this challenge was getting the log (dowel stick) to turn. Here are a few fabulous ways kids solved this. The one above has a straw folded over the stick. This gave it enough space to turn when the handle was cranked. 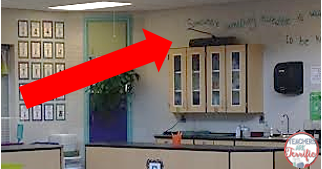 The arrow in the one above is showing you that a piece of tape that is folded over a straw and taped to itself. 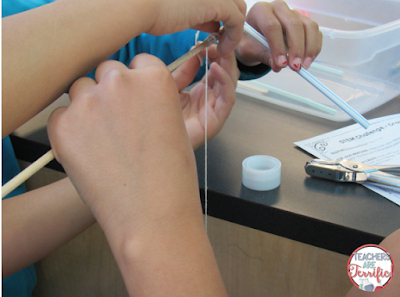 Then they punched a hole in the tape to thread the stick through. 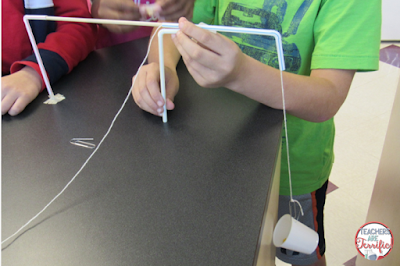 This group resorted to this because they had used all of their other supplies! 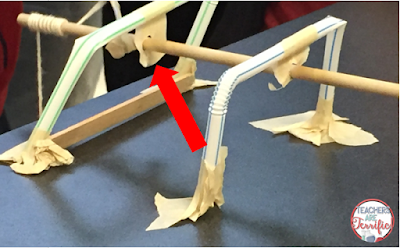 The one above is showing that the team punched holes in the straws and then threaded the stick through. Pretty clever! I loved this challenge! We (the test class) worked so hard to refine and rework the task rules until we came up with constraints that made the task difficult, but doable. By the time I tried this with the next group all the kinks were worked out. The best part is that all week long I would see the test class kids and they would ask how it was going!